A pair of losers must grow up and face adulthood during the middle of a zombie apocalypse. 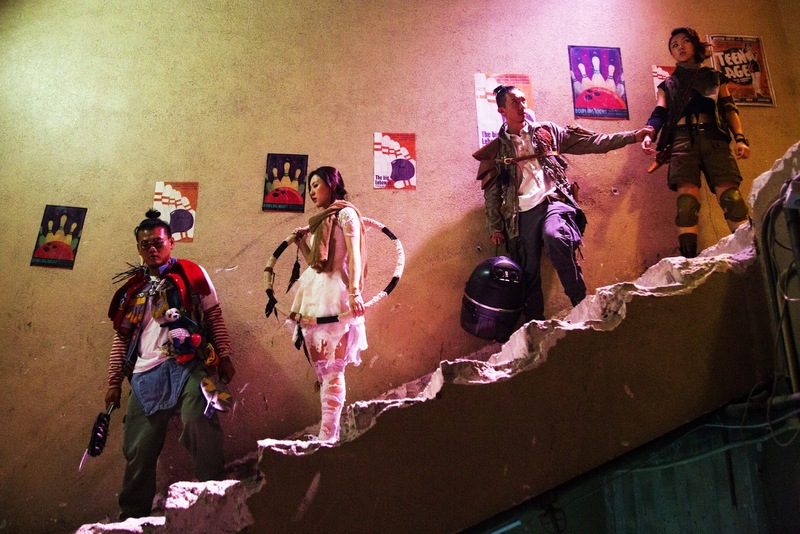 With the massive popularity following "Train to Busan", it seems inevitable that other Asian countries are keen to follow suit in offering their own take on the tired zombie genre which explains this current Hong Kong/China co-production. 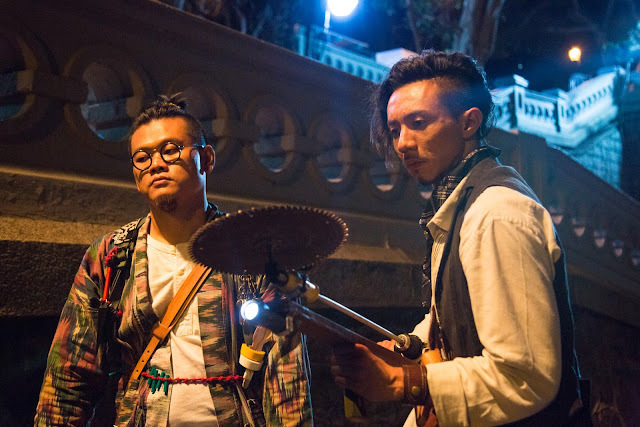 Not only is Alan Lo's debut feature timed perfectly to coincide with that film's success, but also finds that mixture of humanity and comedy as prime ingredients to exploit in this new zombie comedy offering. Trying to move on in life, friends Lung (Michael Ning, from "Port of Call") and Chi-Yeung (Louis Cheung, from "Ip Man 3") are two eccentric hot-blooded young men leading a devil-may-care life that deem themselves heroes who can save the earth, to the annoyance of their friends as all they do is immerse themselves in their own world. However, Lung can do nothing about things in life that don't work out as he wishes, as he's about to embark on a series of life-trials. From losing his childhood home, his step-mother Shan (Carrie Ng, from "City on Fire") suffers from chronic depression and his father Yit (Alex Man, from "As Tears Go By") is just out of jail and is really annoying to get along with, as they attempt to reestablish a connection. In the meantime, a monster from Lung's favorite animated movie appears in the city out of nowhere and turns people into zombies. The outbreak of this zombie crisis is followed by widespread chaos as even Lung's neighbors have become zombies as well. Lung's father happens to be out of town traveling with Shan and forces Lung to risk his life to break into the infected town only to realize he's merely a loser and slick talker. However, he decides not to avoid responsibilities anymore and starts fighting a battle against the zombies. From the start, we're given an idea of the kind of film this wants to be. With an anime opening featuring the two tearing through hordes of zombies featuring homemade weapons before fighting a giant man-sized chicken monster, it sets a strong stage for the rest of the film. This level of goofiness is continued with their childish love of fantasy and superheroes, ranging from dressing up in costumes to role-playing and wearing outfits to children's parties, and it gives the film some solid laughs. Their first encounter in the children's party meeting the zombie child is hilarious for the incredulity of the situation, and the argument to get his parents into believing him is rather funny. A later gag confusing real estate agents for a zombie swarm is gut-busting, and the horse-races in the middle of a zombie apocalypse is another great moment. Still, the majority of the fun comes from their misuse of weapons during the zombie battles to the concept of the zombie outbreak coming from a being that looks like a giant chicken suit. Once again, the anime finale is a lot of fun and ends this on a strong note. As for the acting, it's quite scattered. Our two leads, Lung (Michael Ning) and Chi-Yeung (Louis Cheung) are both admirable in their friendship and play well off each other. Their long-lasting friendship is quite believable and delivers plenty of heart and even some laughs along the way. The stern step-mother Shan (Carrie Ng) is the typical, unapproving parental figure who always manages to put down their interests and pushes them towards successful careers and interests, but does it from a place of love to see them succeed. It's a cliched role and nothing too strenuous but there's not much to do with this kind of role. She gets one scene where she emotionally confronts his father Wing (Alex Man) which falls apart when she's required to tear into him for what happened to her but when she's relaxed and calm she doesn't do bad. Their friend Chan-Yat (Cherry Ngan) is the typical one who tolerates their childish antics, but then she disappears for large stretches of the movie. Overall, though favorable, the acting here is rather mixed. If there's one area the movie falters, it's the overly dramatic scenes. "Zombiology" also tries the same approach with a troubled father/child relationship, but while Busan managed to get this idea right, here it feels more like a retread aping its success. The relationship between Lung and Wing simply doesn't have the same energy here due to the father actually trying to reconnect to the complete refusal of the child. It simply comes off as being stubborn on his part. Likewise, that plays havoc with the film's pacing. Since the action scenes with the zombies are fast and frantic, they come off rather enjoyable and have a lot to like. However, the film stops to a halt when they shift focus to the family dynamics. At times it's possible to even forget a zombie apocalypse is running wild outside if it weren't for the mentions about not going outside and at times it feels somewhat dull due to this. These here are what holds it back slightly. Overall, this is a rather fun and engaging effort that has a lot to like about it. With a lot of fun action, plenty of strong themes and a sense of fun about it, this is definitely worthwhile for those that like a little extra to their zombie films while those who are just here for the blood-and-guts are going to be disappointed by this one.